40 spellbinding stained glass panels in this collection illustrate the legends of love, adventure, exploration, and conquest. They examine the folklore of the Mermaid, of chivalrous Knights, dancing Maidens, Kings on horseback, consorts, musicians, lovers and so much more. 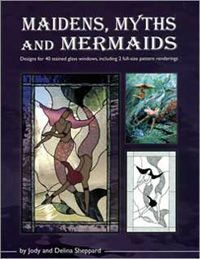 The author presents an overview of how she turns an oil painting into a stained glass design, plus detailed instructions on how to enlarge a pattern drawing. Every project includes the pattern line drawing. 24 projects are shown fabricated with a color photograph while the remaining 16 are rendered as a textured line drawing with color suggestions. Plus 2 designs are provided as full-size patterns printed on a bonus pullout page in the back of the book.